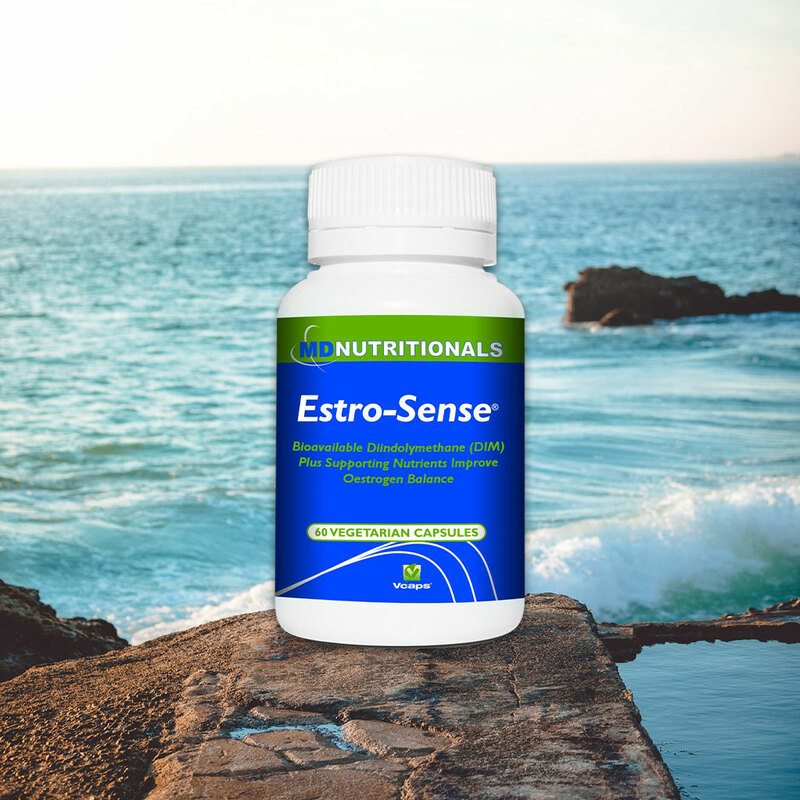 Estro-Sense® features Indolplex® plus Bladderwrack (Fucus vesiculosus), selenium, and D3 to support oestrogen hormone levels. Estro-Sense® features Indolplex®, a proprietary microencapsulated formulation of 3, 3′-diindolylmethane (DIM) with enhanced absorption. DIM is a natural phytonutrient that is abundant in cruciferous vegetables such as broccoli, Brussels sprouts, cauliflower, and cabbage. Specially formulated to support female healthy hormone balance. Bioavailable DIM modulates oestrogen metabolism, and alters urinary oestrogen metabolite profiles in both women and men. Studies show bioavailable DIM assists conversion of oestrogen to the favourable 2-hydroxy and 2-methoxy metabolites. Oestrogens are a group of three biochemically distinct hormones, oestradiol (E2), oestrone (E1), and oestriol (E3). Furthermore, oestrogen is enzymatically converted to specific oestrogen metabolites such as 16-alpha hydroxyoestrones, 2-methoxyoestrogens, 16-alpha hydroxyoestrone (16α-OHE1), 4-hydroxyoestrogens and 4-methoxyoestrogens. Two oestrogen metabolites, 2-hydroxyoestrogen and 16-alpha hydroxyoestrone (16alpha-OHE1), have contrasting cellular activities. The urinary 2:16 OHE ratio (2-hydroxyoestrone/16-alpha-hydroxyoestrone) is therefore an important clinical marker. The 16alpha-OHE1 metabolite is an oestrogen-like product through its binding to the oestrogen receptor; in contrast, the 2-hydroxyoestrone metabolite has low or no oestrogen activity because of its low affinity with the oestrogen receptor. Bladderwrack is a natural source of iodine, and traditional thyroid tonic to support thyroid gland health. Iodine assists thyroid hormone production,and plays a physiological role in supporting breast health. Supplies cholecalciferol (D3) to maintain levels within a normal range. Vitamin D3 has diverse effects in the body. This nutrient improves immunity, supports calcium absorption to enhance bone health, and supports breast and prostate health.